There’s a wave of extreme heat assailing the planet. In several US states its caused road signs to melt, and in some the roads are too. There are forest fires across swathes of a number of European countries: last month over 60 people were burned alive in their vehicles in Portugal. In Italy (where I live) we are experiencing several days of a red heat alert with record-high temperatures, and a drought which has lasted several months with no end in sight. If we don’t act now to prevent the planet from heating up like this, we will all be (quite literally) toast. And yet world leaders in Hamburg have just agreed to quadruple subsidies to fossil fuel companies. Although politicians like Merkel and Macron understand the climate is changing, they also believe that there’s a lack of political will for tackling the problem, and so and very many more roads will melt and very many more cars will burn ; none of them at the hands of the fabled ‘Black Bloc’. The other main story on our local news bulletins is about Italy’s attempts to persuade other European countries to share reponsibilities for the refugee crisis by opening up their ports and agreeing to distribute new arrivals around Europe. Even though in the past Merkel have shown some courage and principles in arguing in favour of Europe’s duty to shelter those fleeing war and economic collapse, now there’s a ‘lack of political will’, even though hundreds of desperate people are drowning and risking death to reach our shores, many of them having experienced brutal treatment in Isis-run camps in the Libyan desert. In Italy itself bigoted parties and stirring up hatred against the very notion of a refugee, and the Left, currently in Government, is capitulating to xenophobic sentiment. The spectacular images of cars burning in Hamburg have been accompanied by very little reporting of the concerns of the (overwhelmingly peaceful) demonstrators. A glance at their banners reveals what their ambitions are: human rights for all, urgent action on the climate and an end to austerity. They are expressing political will. The great lie of the last forty years is that this is the only possible world. If people and the planet must suffer and die in order that some might profit, then so be it. But it’s demonstrably not true. Last month, against all predictions, people in the UK expressed political will. Jeremy Corbyn’s astonishing transformation of the British political landscape proved that where politicians provide principled leadership, they can persuade whole populations to change their minds, even on unpopular issues such as austerity, climate change and our response to the refugee crisis. Naomi Klein’s new book ‘No is not enough’ argues that we (all those who share progressive values, including the notions that human life itself has value and that our species should survive) need to do two things: to understand the ways in which shocking events are exploited by those with the means to do so and used against our interests, and to articulate a positive vision of how we want the world to be. 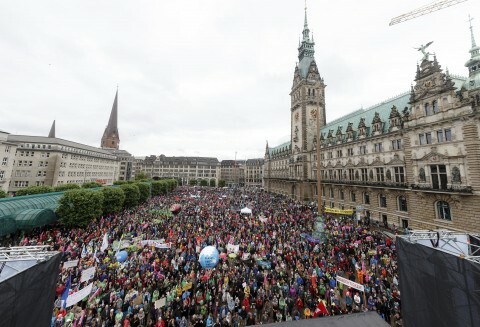 Those who are demonstrating in Hamburg are doing exactly that, and Labour’s near-victory in the UK proves conclusively that there is massive popular appetite for such a vision. An instinctively conservative mass media automatically pushes back against such a movement, seeking to discredit it with images of violent destruction outside the heavily-fortified compounds where our future is being decided; we know that what is being prepared will be infinitely more violent and destructive unless we decide to take on the task of determining our own futures. That will demand a massive exertion of political will on the part of all of us.